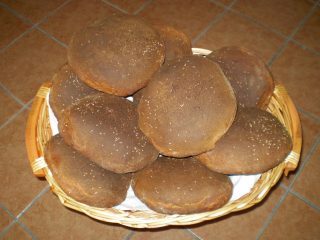 Black Bread of Castelvetrano, now famous throughout the Sicily, is a great product bakery which was losing value over time, just because wrongly considered a product of secondary importance, also has affected the way ii which is realized, in fact is provided in a flour, the tumminia, a lower yield than the classical Russulidda used throughout Sicily, and cooked exclusively in wood ovens that raise the cost of implementation, production of bread so hung in favour of the then white. Only thanks to a recent promotion activities which saw gather the few bakers castelvetranesi that still produce it, the Consortium Panificatori "Bread Black of Castelvetrano". The latter, supported by international Slow Food and the Sicilian Region, aims to protect the production of bread by means of obtaining the necessary exemptions for the use of instruments and traditional products and enhance and promote the product. Fortunately we can still eat this delicious bread and goodness and extraordinary characteristics. Black Bread of Castelvetrano, is in characteristic form to "vastedda", round loaf from the weight of 1 kg (given the growing success today is realized in the form of classical vein lengthened), pale "black" with nuances of light brown given by roasting, on the back include the sesame seeds. Since diameter of about 25-30 cm and 10 cm height, the structure of black bread shows a crisp crust and thick, instead the soft is soft yellow corn opaque and homogeneously alveolata. The additional cuts are half kilo those "cuddure" and finally "cudduredde" of about 150 -- 200 grams. Since intense, very soft and tasty is a delicacy for the palate. 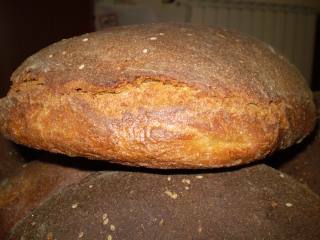 Curiosity: thanks to its long (remains soft, fresh and tasty even for days), formerly the massaie the bread was better realized in the form round by 2 kilos that simply "lu pani" . Black Bread of Castelvetrano, is made with raw materials of local origin, a mixture of semolina rimacinata full of wheat and wheat flour from a particular variety of wheat ground stone, timilia or tumminia, and it is the latter to confer the typical black bread. The dough is made with flour, yeast natural (biga, sour dough residue of the first day), salt and water (approximately 50% compared to semolina); at the end of mix followed by a rest period of about an hour, spezzatura and shaping the manual and a further phase of leavening other 60 minutes. 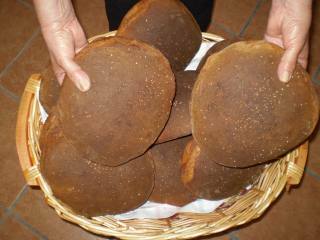 The forms of black bread are cooked only in ovens with walls of stone, fed with wood tree olive nocellara, all for about an hour. Curiosity : tumminia is a variety of durum wheat cycle short, also said wheat Marzuolo. It was sown ringrano or how or when the rainy vintages did not allow seeding in the autumn. sights : tumminia is a variety of durum wheat cycle short, also said wheat Marzuolo . It was sown ringrano or how or when the rainy vintages did not allow seeding in the autumn. Curiosity: an excellent way to degustarlo is in the typical recipe that " Lu Pani Cunsatu ".